We chose the best Neapolitan pizza in Chicago. While the Midwest is a far cry from the Italian region widely recognized for inventing pizza, that doesn’t mean Chicagoans can’t turn out a respectable Neapolitan-style pie. To do so, a pizzeria should use only flour, yeast, salt and water for the dough and dress its classic Margherita version with only tomato sauce, fresh mozzarella, basil and olive oil. Most are cooked in superhot (and superexpensive) wood-burning ovens, but as you’ll see below, that’s not always the case. These top five would do any real pizzaiola proud. Why is this pizza the best? Because, after repeated visits, we were unable to find faults. The crust has that signature Neapolitan chew we were looking for, but somehow manages to pull off a touch of crispness as well. The sauce is bright, slightly seasoned with salt, pepper and oregano, then spread on in perfect proportion, making for a pizza that’s not too saucy and not too dry. And just like the bubbled peaks of the pizza’s edge, a few spots of the fresh mozz get browned in the coal-fueled oven, while the rest melts into luscious white pools under fresh basil leaves. Bottom line: This is one hell of a pizza. In fact, it gets our vote for best overall pizza in Chicago. 1321 W Grand Ave, 312-226-2625. Average pizza: $16. We give these guys credit for kick-starting the Neapolitan craze in Chicago (true, Pizza D.O.C. was here first, but Spacca makes a better pie) when they opened in February 2006. And we give them even more credit for consistency—the Margherita we had here a week ago was just as good as the one we devoured the first week Spacca was in business. Nicely salted dough made from Caputo “00” flour (the finest Italian flour, which has a talcum powder–like consistency) is topped with the unseasoned, crushed San Marzano tomatoes typical of Neapolitan pizzas, huge basil leaves and a generous drizzle of a fantastic extra-virgin olive oil. Perhaps its only fault is its slightly wet center, a quality that certain pizza fiends search for but we find distracting. 1769 W Sunnyside Ave, 773-878-2420. Average pizza: $12. This newcomer has a few kinks to work out (a near-perfect Margherita one day was followed by one with burned edges the next), but it’s turning out some awfully tasty pizzas only a month out of the gate. 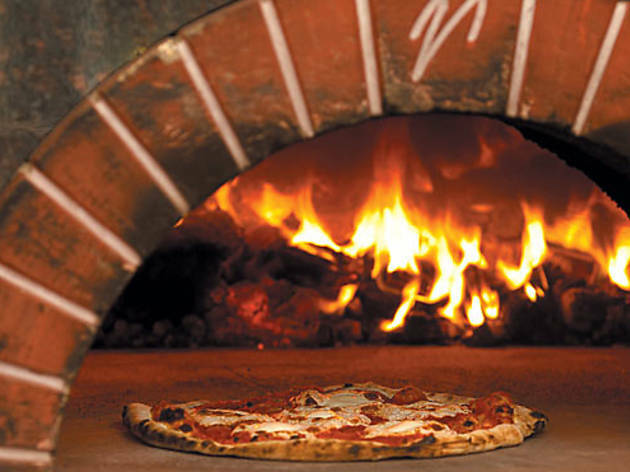 We like the slightly salty sauce and the fat pillows of imported fresh mozz, so we’re hopeful once pizzaiola Gino Losacco masters his new oven, this pizza will only get better. 1235 W Lake St, 312-850-9870. Average pizza: $14. Of the dozen places we tried Neapolitan pizza at, five made it to the final rounds. These five were decent runners-up, but we’ll leave out the bottom two to save them from embarrassment. Here’s why these spots didn’t make the cut. We love, love, love the atmosphere and this super-friendly neighborhood joint (the owner stopped by every table to say hi, a server brought a baby some cooked dough scraps to chew on), but the pizza was soggy. Maybe the mozz wasn’t drained properly or something, but the entire pie, not just the center, was wet. Also, the dough didn’t pack much flavor. 7419 W Irving Park Rd, 773-804-9024. Something must have happened to this little takeout joint between the time our co-workers went there and proclaimed it one of the best, and last month when I visited for the article. It’s basic, at best. The sauce was sweet and the pie was a giant mound of shredded orange-yellow cheese (no fresh mozz was discernible) and there was no fresh basil, only some dried oregano sprinkled on top before it went into the oven. 2205 W. Montrose Ave, 773-588-1550. We gave these guys some slack since we went to press on the pizza issue only two days after they opened for business, and we found that the Margherita was indeed a tasty pie—it just wasn’t good enough for top five status. If we were to rank runners-up, this would be #6. Give ‘em a few weeks and I’m sure they’ll get even better. 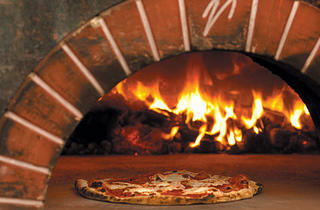 59 W Grand Ave, 312-329-0400, Average pizza: $16.